It is November 2015 and I have a meeting with Head of the Nicaraguan National Police Force, but before we enter his office Yonas and I have to pass not only a quick security check, but a festival of food and music taking place in Managua’s main police compound. Stalls have been set up in the car park and gardens of the compound. Police officers and civilians mill around both buying and selling traditional street food, quesillos and tamals, washed down by beer, soda and sweet pinol. Several stalls have signs up stating that all profits will go to charity. Music blares from a stage where a band knocks out classic salsa and latin rock hits. This is not the scene we had expected when we arranged the interview. Not the sober image of the Sandinista state and police force we had encountered in international reports and academic texts. However, as I quickly learned in this first period of research in Nicaragua, it is an image that is significant in telling us something about the remarkable success of the Nicaraguan Police Force in reducing crime rates. It is telling of the significance of the importance of close community-based relations between the National Police and the local population. Central America is a region plagued by criminal violence. Whilst the rest of Latin America has seen the levels of homicide drop significantly, Central America has seen an opposite trend, reaching a top in 2011 with 43.8 per 100 thousand inhabitants. Around 83% of these homicides were committed with the use of firearms. Over the last couple of years the incidence of violence and homicides has been particularly marked in Honduras (66 per thousand) and El Salvador (68.6 per thousand). In these countries organized crime and gang violence, linked to the international drug trade and the operation of the cartels, have increased, not reduced, as a result of the respective governments efforts to use militarized “mano-dura” (heavy-handed) policing tactics. As a result of the violence in these countries, a wave of migrants – many of them unaccompanied minors – have been displaced and fled to other countries including arrival at the US border. Within this rather bleak regional picture of criminal violence, Nicaragua stands out as a notable exception. Indeed, available statistics demonstrate Nicaragua to have the lowest levels of homicide (8 per thousand), robbery, youth delinquency, and insecurity in the region. Also significant is that polling carried out by Americas Barometer in 2014 suggests the country has the highest level of confidence in its police force in the region. Why is Nicaragua so distinct? Existing research carried by the European Union and German international cooperation suggests that close community relations between police and community might have something to do with it. Indeed, over the last decade they have been investing in supporting projects that further support this conclusion- further supported by Norwegian financing. However, there is also recognition that the Nicaraguan model is not easy to emulate. They suggest that Nicaragua´s political history, and in particular the effect of the Sandinista Revolution in the late 70s and 80s in restructuring state-community relations, has a great deal to do with current circumstances. Following the Revolution the National Guard was disbanded and a new National Sandanista Police Force established. Drawing on the example of the Cuban Revolution, the Sandanista´s established a police force that established a high degree of local presence and integration within urban and local communities. Police officers were recruited directly from communities, and returned to the same communities following training. Structures were also established to guarantee a regular flow of information about criminal activities, but also developmental challenges in the community. In the 1990s, the National Police Force was established following governmental reforms that emphasized professional training in line with other police forces in Central America. However, the Sandanista revolutionary ethics of a police force that serves and is integrated into the community largely remained. Whilst questions might be asked by some about the ideological orientations of the National Police, it is evident that the close community relations they allowed to form have been essential to efforts to stall criminal activity in the country. Whilst youth gangs have been established and the international drug cartels have attempted to move into the country, because of these structures community and police alike immediately observe their presence and activities. This enables a speed and socialization of response not seen elsewhere. My initial meetings with the Nicaraguan Police Force have gone well and we have entered into a good dialogue. Over the next four years I hope that we will have many more encounters with them in the course of our ICT4COP research. Indeed, I hope that we can carry out critical research on details of what has happened and what is happening in relation to community-based policing that is still little studied. Little is still known of how “jefes de sector” (neighbourhood leaders and committees) communicate with the police on a daily basis. Little is also known as to whether changes are taking place. In 2015 the Ortega government introduced a reform of the security sector, and with it intended changes to the leadership structures of the National Police. Once significant concern is that the apparent desire of the Presidency to reassert power over the security apparatus in the country will lead to a removal of the revolutionary participatory ethics and organization of the National Police force- to which its success is attributed. Little is also known about how the National Police Force is weathering changing dynamics in the regional fight against organized crime. As violence rises in bordering nations, increased efforts have been made by criminals to establish safe zones in isolated areas of the Nicaraguan frontier. Landing strips and other installations for the transport of drugs towards the North are also regularly encountered in swamps and forests of these regions. Whilst community-based policing is effective in highly populated areas, its effectiveness in areas of low population density and access to poor technological resources is questioned. 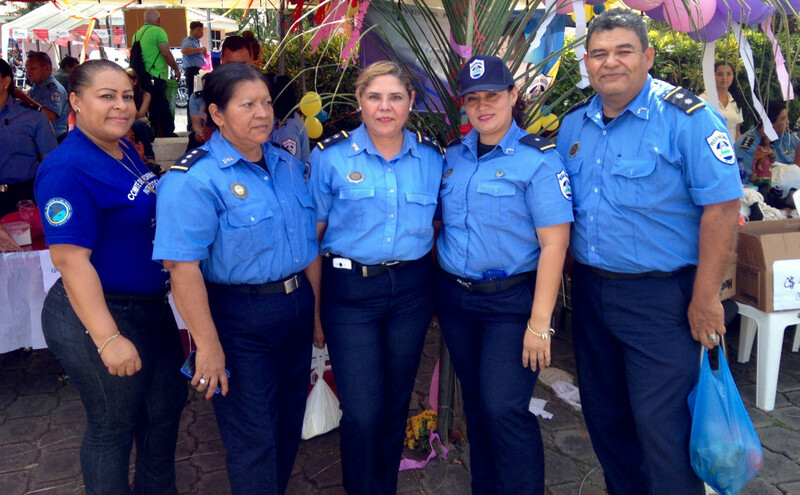 For now the Nicaraguan Police have reason to celebrate.